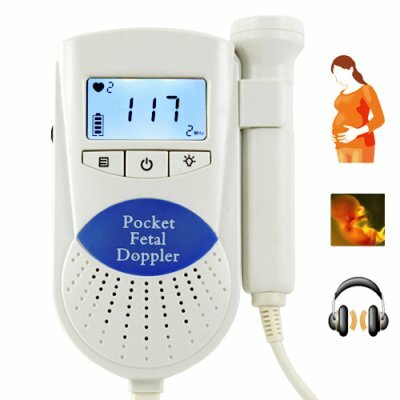 Successfully Added Baby Fetal Heart Rate Monitor and Reader Doppler to your Shopping Cart. This doppler baby heart rate monitor is the perfect way to listen to your baby's heart rate right at home. Now all mothers can enjoy the pleasure of listing to their baby's heart without the need to get in the car and going on a stressful drive to the hospital. Listen to your baby's heart beat through either the onboard built-in speaker or through the use of the 3.5mm earphone input. If you are a computer savvy individual, then you can also use a 3.5mm jack cable to connect this baby heart rate monitor to your computer and record your baby's heart beat using the already provided sound recorder in the Windows operating system. This pocket sized portable heart rate monitor only requires 2 AA batteries to power-up and your good to go, allowing you to take your new Heart Rate Monitor with you anywhere. The H22 is designed with three modes that each has its unique spacial function. Mode 1 displays the heart icon when the heart beat of your baby is detected, and also displays the real-time heart rate. Mode 2 displays the heart icon when the heart beat of your baby is detected and averages the heart rate for a more stable reading. Mode 3 calculates an average heart rate over a specific period of time by manually pushing the backlight button to start and stop the reading time. The CVLT-H22 comes in a compact form factor design to withstand repeated usage without wearing out or breaking. This extremely useful Heart Rate Monitor is available in stock now for single and bulk purchases. Order yours today, and experience the divine pleasure of listing to your baby's heart beat right in your home.